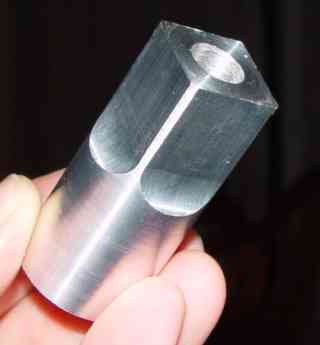 This is a die to be attached to an air cylinder for ramming powder into tubes. It is turned from 1-inch diameter aluminum round stock (6061 alloy). The outside diameter is 1.000 inch, which may be turned from the rough stock which is slightly oversize at about 1.006. This finished diameter fits into a 1-inch ID stock paper tube. 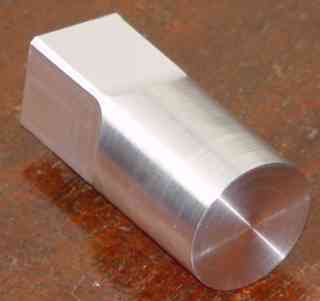 The milled flutes provide relief to allow freer sliding of the die in the tube, while the rounded corners at the full OD still hold the axial alignment. A 7/16-20NF x 1 inch hole is drilled and tapped to fit the spindle of an 2.5-inch air cylinder, which with 90 psi shop air develops about 440 pounds of linear force. The flutes also provide surfaces to attach an adjustable end wrench for tightening the die onto the air cylinder spindle. Since a 1-inch circle has an area of pi x (1/2)^2, or 0.79 square inches, the effective ramming pressure is about 560 psi. This is sufficient for pressing pyrotechnic gerbs and flares. A tiny dimple at the center of the pressing face, made during the lathe facing, leaves an impression at the exact center of the pressed material, providing a location for subsequent drilling of a throat in the gerb plug. The geometry of the flutes is controlled by the sqrt(1/2) = 0.707 inch sided square which inscribes a 1.000 inch circle. This would require a flute depth-of-cut of each flute of (1.000-0.707)/2 = 0.147 inch. Since we want to leave some of the OD instead of sharp corners where the flutes meet, we will shrink this slightly to 0.133 inch. The length of the flutes is set by a table stop to be about 1 inch, including the sloped portion. Clamp a length of rough round stock to the milling table along the X axis using vee blocks and tee nuts. Align the axis of the rod with the X axis of the table. Clamp a stop block against the tail of the stock to maintain registration when the rod is later rotated. 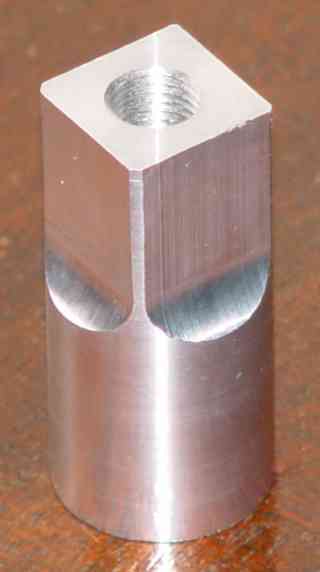 Face the head end of the rod square using side milling. Flip the stock end for end and repeat the facing cut, leaving a clean cut face on both ends, one to register against the stop block, and the other the work end. Side mill two flutes (vertical faces) as follows: set the table X stop for the position of the sloped end of the flute. Bring the milling cutter alongside the middle of where the flute will be cut, but still standing off from the work. Run the mill and slowly bring the work in the Y direction to the cutter until it just touches and chips fly. Zero the Y handwheel and move the cutter off the head end of the work. Move the table 0.130 in Y for a rough cut of the first flute. Finish with a cut of 0.003 in Y for a total of 0.133. Repeat to cut the flute on the opposite side. To help align the next clamping position, end mill a flat cut on the top surface where the third flute will go, but not as deep towards the axis or along the work. Loosen the clamps and rotate the rod 90 degrees. Use a machinists square on the end milled flat cut to align the rotation of the rod with the table, align in Y with the table edge, and align in X using the block stop. Cut the second pair of flutes (one will complete the end mill cut) using side milling as for the first pair, using the same X stop. Unclamp the work. Saw the milled end off at double the flute length, plus a bit more to allow for facing on the lathe. Clamp the rough end in the lathe. Face the fluted end. Insert a dimple to after facing to center a drill. Drill the 7/16-20NF tap hole (drill size W). Tap the hole with a tap started in the tailstock drill chuck and finished with a hand-held holder. Remove the work from the lathe chuck. Chuck a length of 7/16-20NF threaded drill rod or headless bolt in the lathe. 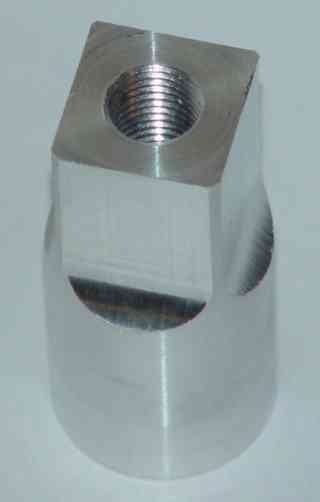 Screw the work onto this bolt, and tighten the flat face against the chuck jaws. Check runout with a dial indicator, and adjust the bolt in the chuck if needed to zero out any runout. Turn and face the opposite end of the work to final dimensions. Leave a centered, raised dimple on the face for impressing a throat center. This would all be easier with (1) a rotary table for the milling machine, and (2) a 4-jaw chuck for the lathe. But I don't yet own either of those. Have a comment or question about my air cylinder die?